The worldwide fleet of yachts for sale continues to grow as Axel Douque at Ocean Independence sends news that he's listed the 34.95m motor yacht Symphony in a joint central agency with Mark Seaton at Yacht & Villa. 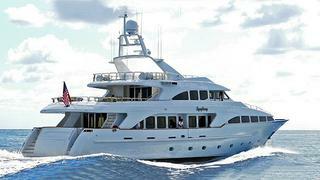 A Benetti Classic 115 built to ABS class in 2000, Symphony accommodates 10 guests in five staterooms and there's extra bed space in the saloon and skylounge, increasing the sleeping capacity to 14. Twin 1550hp MTU engines power her to a cruising speed of 15 knots and a range of 3,300 nautical miles. Lying in Kiel, Germany, Symphony is asking €4.95 million.